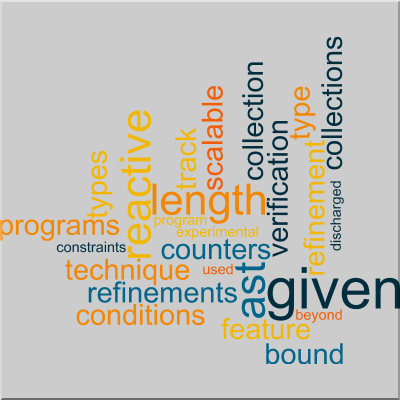 2018.11.23: Paper "Type-directed Bounding of Collections in Reactive Programs" accepted to VMCAI 2019. 2018.08.01: Advisee Shawn Meier pitched at Catalyze CU Demo Day 2018. 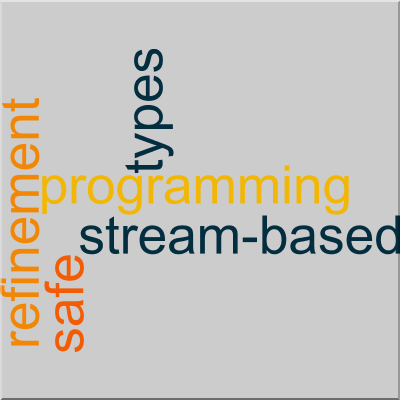 2018.07.03: Paper "Safe Stream-Based Programming with Refinement Types" accepted to ASE 2018. 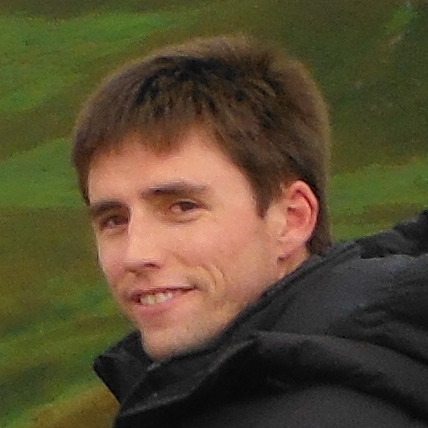 2018.06.01: Postdoctoral mentee Sergio Mover accepts a faculty position at École Polytechnique. 2018.03.23: Paper "Mining Framework Usage Graphs from App Corpora" wins the IEEE TCSE Distinguished Paper Award at SANER 2018. 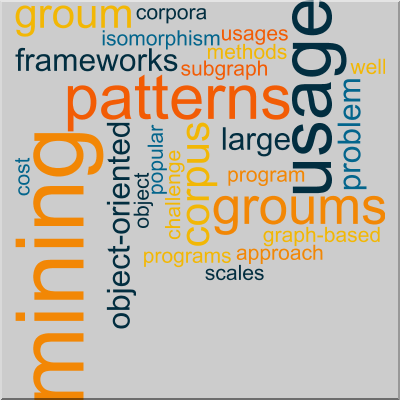 2017.12.17: Paper "Mining Framework Usage Graphs from App Corpora" accepted to SANER 2018. 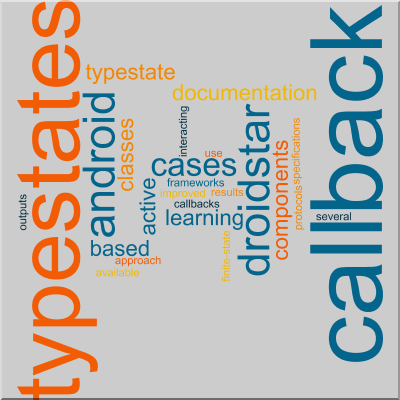 2017.12.13: Paper "DroidStar: Callback Typestates for Android Classes" accepted to ICSE 2018. 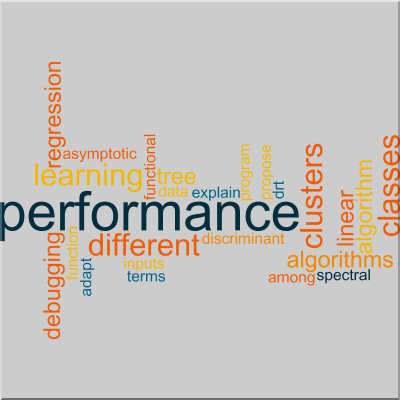 2017.11.28: Paper "Differential Performance Debugging with Discriminant Regression Trees" accepted to AAAI 2018. 2017.08.02: Paper "ChimpCheck: Property-Based Randomized Test Generation for Interactive Apps" accepted to ONWARD! 2017. 2017.06.22: Promoted to Associate Professor and granted tenure. 2016.04.17: Submit to APLAS 2017! 2016.12.22: Paper "Discriminating Traces with Time" accepted to TACAS 2017. 2016.10.13: Paper "Semantic-Directed Clumping of Disjunctive Abstract States" accepted to POPL 2017. 2016.08.16: Paper "A Vision for Online Verification-Validation" accepted to GPCE 2016. 2016.05.15: Call for postdoc applicants for Fall 2016. 2016.05.13: NSF grant "Online Verification-Validation" awarded with Matthew A. Hammer and David Van Horn. 2016.04.17: Consider submitting to APLAS 2016. 2016.02.14: Consider submitting to SAS 2016. 2015.11.01: Call for postdoc applicants for Spring or Summer 2016. 2015.11.01: Call for PhD student applicants for Fall 2016. 2015.10.28: Paper "Selective Control-Flow Abstraction via Jumping" presented by Sam Blackshear at OOPSLA 2015. 2015.09.01: Consider submitting to VMCAI 2016. 2015.08.04: Paper "Selective Control-Flow Abstraction via Jumping" accepted to OOPSLA 2015. 2015.05.27: Advisee Sam Blackshear defends his PhD "Flexible Goal-Directed Abstraction" on May 28. 2015.05.18: Call for postdoc applicants for Summer or Fall 2015. 2015.04.25: Paper "Droidel: A General Approach to Android Framework Modeling" accepted to SOAP 2015. 2015.04.21: DARPA grant "STAC: Auditr: Securing Space/Time Defenses in Java Bytecode" awarded with Pavol Černý, John Black, Sriram Sankaranarayanan, Işıl Dillig, Marijn J. H. Heule, and Henny Sipma. 2014.12.16: Paper "Desynchronized Multi-State Abstractions for Open Programs in Dynamic Languages" accepted to ESOP 2015. 2014.09.24: DARPA grant "MUSE: Mining and Understanding Bug Fixes to Address Application-Framework Protocol Defects" awarded with , Pavol Černý, Sriram Sankaranarayanan, and . 2014.06.01: Papers "Automatic Analysis of Open Objects in Dynamic Language Programs" and "An Abstract Domain Combinator for Separately Conjoining Memory Abstractions" accepted to SAS 2014. 2014.04.18: Paper "QUICr: A Reusable Library for Parametric Abstraction of Sets and Numbers" accepted to CAV 2014. 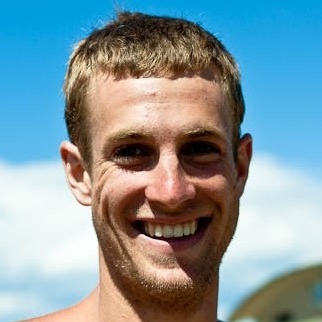 2014.02.03: Advisee Sam Blackshear wins a Facebook Graduate Fellowship! 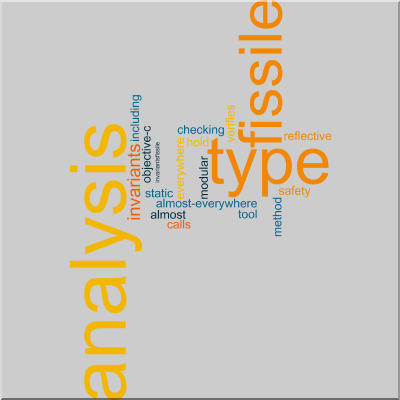 2013.10.01: Paper "Fissile Type Analysis: Modular Checking of Almost Everywhere Invariants" accepted to POPL 2014. 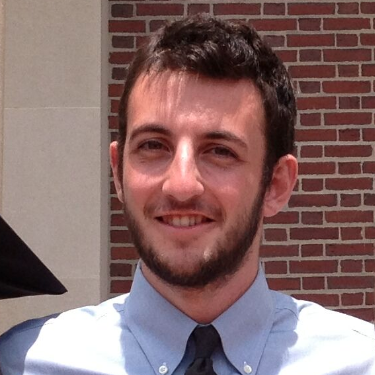 2013.05.21: Advisee Arlen Cox wins a Chateaubriand Fellowship! 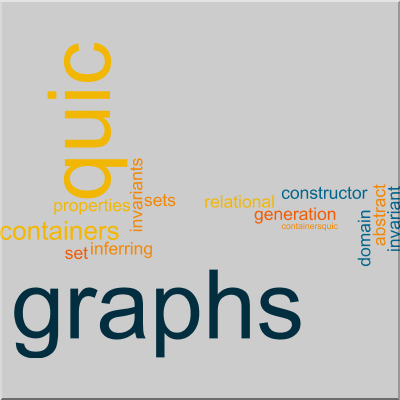 2013.03.04: Paper "QUIC Graphs: Relational Invariant Generation for Containers" accepted to ECOOP 2013. 2013.03.04: Submit Analyzer Pearls to TAPAS 2013. 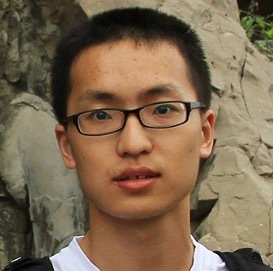 2013.02.04: Paper "Thresher: Precise Refutations for Heap Reachability" accepted to PLDI 2013. 2012.10.12: Paper "Reduced Product Combination of Abstract Domains for Shapes" accepted to VMCAI 2013. 2012.09.07: NSF grant "Modular Reflection" awarded. 2012.05.21: Paper "Invariant Generation for Parametrized Systems using Self-Reflection" accepted to SAS 2012. 2012.04.20: Paper "Measuring Enforcement Windows with Symbolic Trace Interpretation: What Well-Behaved Programs Say" accepted to ISSTA 2012. 2012.03.27: Paper "A Bit Too Precise? 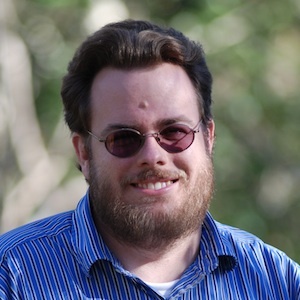 Bounded Verification of Quantized Digital Filters" presented by Arlen Cox at TACAS 2012. 2011.12.16: Paper "A Bit Too Precise? Bounded Verification of Quantized Digital Filters" accepted to TACAS 2012. 2011.09.14: Paper "The Flow-Insensitive Precision of Andersen's Analysis in Practice" presented by Sam Blackshear at SAS 2011. 2011.06.10: Talk "The Flow-Insensitive Precision of Andersen's Analysis in Practice" given at UC Berkeley. 2011.05.21: Paper "The Flow-Insensitive Precision of Andersen's Analysis in Practice" accepted to SAS 2011. 2011.03.16: Talk "Xisa: Extensible Inductive Shape Analysis" given at Carnegie Mellon University. 2011.01.26: "Calling Context Abstraction with Shapes" presented by Xavier Rival at POPL 2011. 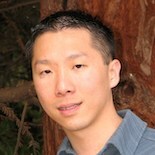 2010.12.14: NSF CAREER grant "Cooperative Program Analysis: Bridging the Gap Between User and Tool Reasoning" awarded. 2010.10.04: Paper "Access Nets: Modeling Access to Physical Spaces" accepted to VMCAI 2011. 2010.10.03: Paper "Calling Context Abstraction with Shapes" accepted to POPL 2011. 2010.06.09: "Mixing Type Checking and Symbolic Execution" presented by Khoo Yit Phang at PLDI 2010. 2010.03.24: "Separating Shape Graphs" presented by Vincent Laviron at ESOP 2010. 2010.01.30: Paper "Mixing Type Checking and Symbolic Execution" accepted to PLDI 2010. Ph.D. Positions. I am always looking for enthusiastic students interested in working with me on research projects in programming languages and software systems. If you are interested in finding out more, please contact me. For insight into the Programming Languages and Verification group, take a look at our most recent recruiting talk. 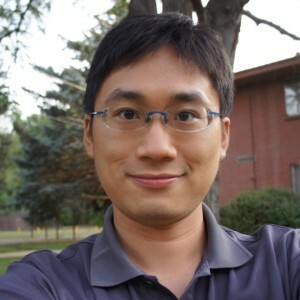 I am an associate professor in the Department of Computer Science and the Department of Electrical, Computer, and Energy Engineering (by courtesy) at the University of Colorado Boulder. 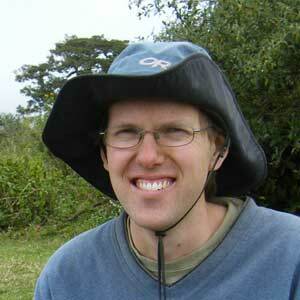 I am a member of the Programming Languages and Verification Group (CUPLV). My research focuses on making software better and programmers more productive by investigating the fundamental principles and techniques needed to algorithmically assist the software developer throughout the software engineering process. Our advances seek to help users better specify what they care about, interact with automated reasoning engines, triage the alarms from tools, and leverage source code repositories to improve their software. This work is often driven the needs of today's real-world applications to ultimately inform tomorrow's designs. I completed my Ph.D. with George Necula at the University of California, Berkeley and spent a semester as a postdoctoral researcher with Jeffrey S. Foster in the PLUM group at the University of Maryland, College Park before joining the University of Colorado Boulder. Termination, complexity, and cost analysis: denial-of-service, algorithmic security vulnerabilities, Java. Co-advised with Pavol Černý. Specification and verification of event-driven systems: lifestate specifications, specification mining, callbacks, Android. 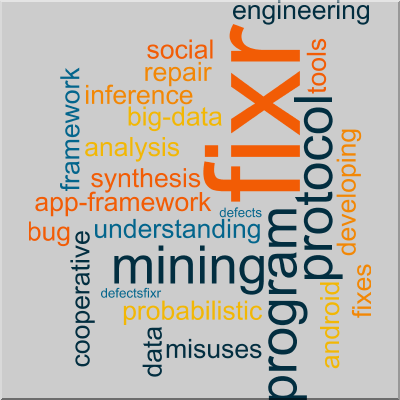 Mining and understanding bug fixes for app-framework protocol defects: event-based object protocol verification. Precise refutation analysis: heap reachability, may-witnesses, false alarm triage, memory leaks, Android, Java. Mining and understanding bug fixes for app-framework protocol defects: property-based testing of interactive apps, big data pipelines. Incremental verification-validation: data structure invariants, incrementalization, C.
Developing program analysis, probabilistic inference, program synthesis, social data mining, and big-data engineering tools to cooperative repair Android framework protocol misuses. 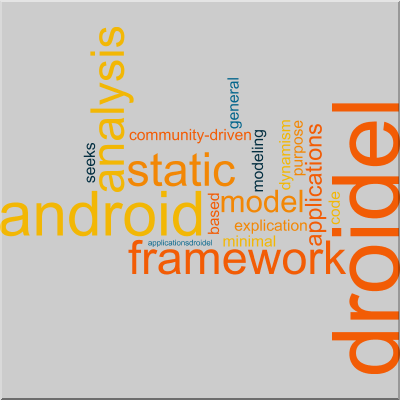 A community-driven modeling of the Android framework for static analysis of Android applications. 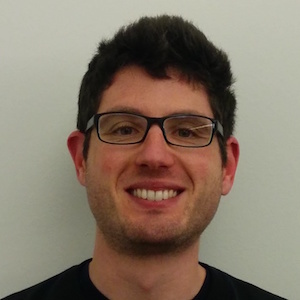 Droidel seeks to be a general purpose model for static analysis based on minimal explication of dynamism in the Android framework code. An abstract domain constructor for inferring invariants about sets and set properties of containers. A static analysis tool for Java programs that specializes in checking heap reachability properties and provides automated alarm triage assistance. A static analysis tool for C and Objective-C that verifies invariants that hold almost everywhere, including the safety of reflective method calls. Efficient algorithms and automatic tools for reasoning about heap-manipulating programs, such as those that use recursive data structures like pointer-based lists and trees. DARPA MUSE Demonstration Workshop. Arlington, Virginia, USA. Huawei Vision Forum. Santa Clara, California, USA. Max Planck Institute for Software Systems. Kaiserslautern, Germany. École Normale Supérieure. Paris, France. Google. Mountain View, California, USA.